People, there's a new (relatively speaking - they opened in January) pizza joint in town and it's going to blow your mind. It's called Old Fourth Ward Pizza; it's across from Krog Street Market; and it's AMAZING. You wouldn't know it if you stumbled across it. It honestly looks like Sbarro-esque with old school ice cream parlor tables and no ambiance to speak of. (In fact, I think it shares space with an ice cream place.) You also can't get an adult beverage there (but if you think ahead, you can BYO). But what this place lacks in ambiance it makes up for in the pizza. I've only tried one thing there because there is only one thing you should try there and eat over and over and over: the Grandma Pie. 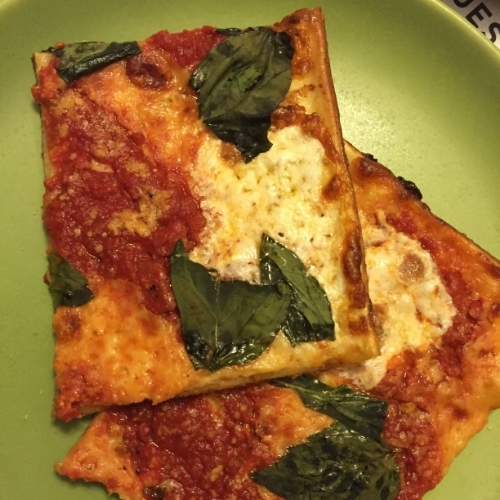 "In Atlanta, where round pizzas and those with exotic, Neapolitan names get all the attention, O4W Pizza’s rectangular masterpiece called Grandma is a tantalizing alternative. The Irwin Street Market pizza joint specializes in pies made with simple, quality ingredients and not a hint of trendy brouhaha." "I love this pizza. I love eating this pizza. I think about this pizza way more than someone should think about a food item." "It’s almost mysterious in a way. It’s very simple, but there’s something magical about it. I think they sprinkle it with fairy dust." This is Jersey style pizza. Thin crust with lots of sauce and cheese. According to Old Fourth Ward's website (www.krustco.com) Chef and owner Anthony Spina learned the pizza business the old fashioned way – by working it. Growing up in New Jersey, Anthony became an expert at the art of making simple, handcrafted pizza. I've eaten the Grandma pie twice: once on site and once to go. If you eat there be prepared to wait: it takes about 30 minutes to get a Grandma from order to table. And like I said, with no booze that makes waiting a bit painful. Plan ahead and BYOB or W or order your pizza and go over to Krog Street Market and toss a few back while you wait. Once you get the Grandma pie in front of you, all that stuff fades away. This pizza fills the box corner to corner. Neopolitan style crust is more my jam, but in this case it works because you will not taste better sauce and cheese anywhere. ANYWHERE! We rated O4W Pizza a 49.25 out of a possible 60 points total. When scoring on food only (removing the "dining experience" category), we rated O4WP a 36.25 out of 40. That's 90% approval! Overall, another really stellar addition to Atlanta's already incredible pizza scene. How lucky can one town get?? P.S. Even the cat likes the Grandma pie!